Staying true to the iconic styling of the Rangemaster Classic, with it’s bevelled doors and arched window the Classic Deluxe delivers a host of innovative, up-to-the-minute features whilst retaining it’s traditional looks. The 5 zone Induction hob is fast, responsive and incredibly controllable, offering the ultimate in speed and energy efficiency, heating just the pan not the hob itself. Spillages won’t burn to the surface making cleaning exceptionally easy. The added safety measure of residual "hot hob" indicators makes induction a great choice for families. Rangemaster’s unique Preparation and Simmer settings for melting butter and chocolate, simmering vegetables or cooking pasta help to create perfect results every time. Other standard Rangemaster features such as the Handyrack in the main oven, means no more burning your hands reaching in to the oven cavity to check your roast. It attaches to the main oven door and gently pulls the roasting tray out as you open the door and will support a roast weighing up to 5.5 kilos safely. The tall right hand fan oven with an 82 litre capacity is one of the biggest on the market. With four shelves it is perfect for batch baking or family pizza nights in addition to everyday use. The main left-hand oven has catalytic liners which reduces greatly the amount of cleaning required to just the base and door and the tall fan oven has an easy clean enamel coating. 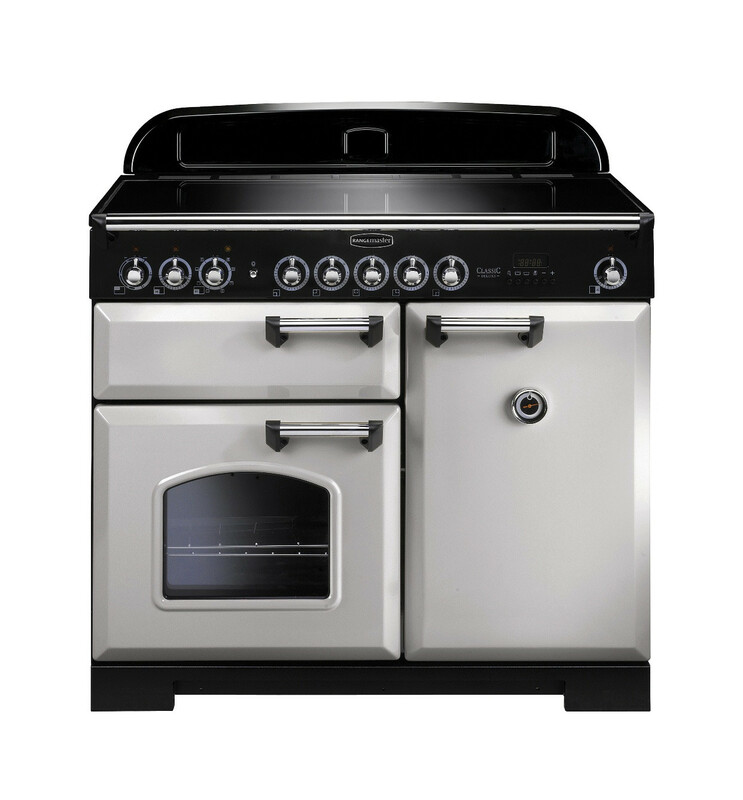 Available in a wide selection of colours there is a Rangemaster Classic Deluxe 100cm Induction Range Cooker which will look perfectly at home in any kitchen. Choose from an extensive colour palette of black, cranberry, cream, white, royal pearl, olive green, regal blue and racing green combined with a choice of chrome or brass trim.